The Pimp of Hampton Finally Paid His Bill! This post is an update to a previous article I wrote detailing the real reason the Pimp of Hampton (GA) was preaching eternal hellfire and damnation against non-tithers: he didn’t have enough money to pay his delinquent property tax bill. Well, it looks like the 8th Pastoral Anniversary held in his honor in late February (as well as subsequent shakedowns) has paid off for the Pimp of Hampton…HE PAID HIS 3 MONTH LATE PROPERTY TAX BILL! It appears as though the Pimp of Hampton has some influence with Henry County (GA) Government (a few officials are sumbitted to him at his club). 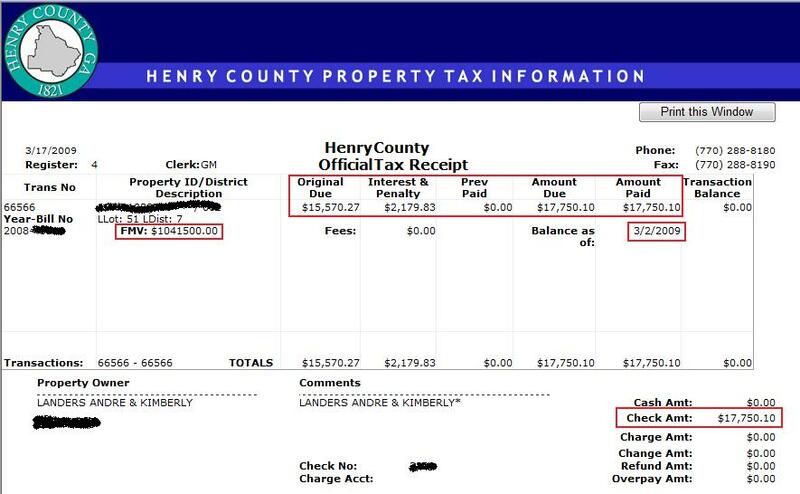 The website that allows Henry County (GA) residents to pay their tax bills online has been “down” for the past 7 days. A call to the County tax office yielded an “I don’t know when the site will be back up” from a clerk. Call me a cynic, but I think the Pimp’s influence is on display for all to see. I guess the Pimp of Hampton’s handlers within Henry County government wanted to make sure that the Pimps check was processed – and cleared – before they put the web site “back on line”. Keep in mind, this is an alleged minister of the Gospel who preaches the prosperity gospel heresy in order to shear the sheep for personal gain, yet he’s having problems paying his own bills. I guess all of the “special anniversary love offerings” laid at “the prophets feet” paid off. Way to go, Pimp of Hampton. Next time, have the County take down their website BEFORE you’re delinquent on your tax bill. Oh, and take heart, sheeple of Higher Living Christian Church, the Pimp is already crowing about how you owe him for the upcoming “first fruits” offering. I guess all of the “special anniversary love offerings” laid at “the prophets feet” paid off.–This certainly will not help him be compensated when this person stands before God at the end of his days. Thanks for keeping up with this! Yes the Pimp paid his tax bill thanks to all of the faithful sheeple of NBS aka HLCC. Trust me he’ll have another bill due. My question? How many of the shepple have their bills/needs met? Oh yea, BIG thanks to all of the sheeple of “Club Hustle & Flow” for paying for”One Trick Pony.” He has no other revenue stream other that the contributions of the sheeple .He has been pimping for 8 years ans unlike his daddy he has not written a single book. However I am sure he has bought up a foreclosed property or two courtesy of some of his MEMBERS! Well you know they are checking on all the derelict lawmakers in the GA legislature who are faking the funk. Id be interested in knowing what other big time, wanna be pimps in training are shaking down the sheeple but havent paid their “tithe” Uncle Sam and other self imposed financial obligations. I was thinking the very same thing gcmwatch. Just like pulpit pimps, Georgia legislators are guilty of “do as I say, not as I do”, hypocrisy on full display. Also like the pimps, they demand more and more of our (tax) money while failing to show accountability and good stewardship – primarily because they know they’ll always have the power of brute force behind them (whether it’s the government’s ability to take everything you own if you defy them, or the pimps twisted admonition that God will strike you dead if you “rob” Him). HELLO! Wake up people…. You can’t pay for favor! OK, HIGHER LIVING DISCIPLE, I’ll take your bait – only because this is hopefully a teaching lesson for you, and I pray that your mind matures as you grow in age so that you become a disciple of God and NOT of your pimp’s club (hence, your screen name). What exactly is “hallfire and damnation” that your pimp speaks? Are you declaring that he can “speak doom” over those who dare expose his misdeeds? The “most humble and sweet man there is” is a notorious false teacher who does not preach the Gospel, and unfortunately for you, you absorb every word of his heresy. I’ll end with this: read the Word of God in context so that you can clearly understand the fallacy of the “touch not mine anointed/get you mouth off the mand of gawd” defense that you have erroneously applied. Also, here is an example of an 17 year old who knows sound doctrine, and studies God’s TRUE Word tirelessly – without the aid of a lying pimp. Perhaps Doug can disciple you so that you learn the Word of God and defend it instead of the lying false prophets. I will pray that you repent of your allegiance to a false prophet and learn to follow Christ Himself. Well…It looks like you are the demographic Landers sought after… young (In wisdom), impressionable and naive. Thank God that He gives us opportunity to grow. Please become a disciple of CHRIST and not a disciple of man! I dont think HLD’s age has anything to do with it. Satan really doesnt care how old a person is as long as they will take the bait of deception. The good thing is that HLD still has (hopefully) time, opportunity, and grace to wake up and truly follow Christ. People The Kingdom is within!! Trust me, we all our anointed and have the same knowledge and ability to lead and guide.What we miss is that we must lead and guide ourselves first…thats the hard part. Inner growth is difficult but the journey must be pursued on a daily basis. Unfortunately, we seek not and the results is that we will fall prey to those who do seek their journeys’ path. The truly rightous ones seek this inner “secret” knowledge and use it to the betterment of Spiritual growth for themselves and others not to its detriment [like most of todays’pastors]. Yes christian folk…for the most part you are being “had” as todays big pastors’ have become almost untouchables and they are leading their sheep [you] away from their true spirit selves…while yes taking your money weekly in the process. AND IT MAKES ME ILL! POWER DONT CORRUPT ABSOLUTELY…IT “ABSOLUTELY” CORRUPTS…especially with no checks and balances [true deacon and executive boards]. Why it makes me ill…because I have been there on the inside watching them. It is different sitting in the pulpits seeing none of it and falling for the BS, but another to see it from behind the scenes. Trust me it breaks your heart! !I have known personally a few of the local pastors…including the one being mentioned on this blog…when they had nothing and knew nothing.It’s a secret game you all. YOU ARE DOING ARITHMETIC…THEY ARE DOING CALCULUS. If you dont know how to do calculus…you wont see it and you will fall prey to those that have taken the time to learn it. But there is hope and it lies within you.SEEK AND YOU SHALL FIND,ASK AND IT WILL GIVEN UNTO YOU. Folks, that dont mean what we have been taught. It really means to seek your own inner growth and spirit with the Divine One. Its equal to mastering a an instrument and a martial art. It takes time…it takes self discipline. It takes inner prayer and meditation daily…IT TAKES STUDY [and not the kind you are getting on Wednesday nights & Sunday morning]. Thats the “rithmetic” i mentioned earlier. Beloved ones, if you dont approach it from this inner standpoint…you will perish [as the word eludes to]…because you dont have this “particular” type vision!!! Didnt mean to be long here!But enough is enough!! p/s google Reuben Armstrong’s site. Another former and brave insider,who is telling you the truth…despite his method. Are you serious…. Because he was not able to pay a bill that makes him a bad person and deserving to be condemed? If that’s the case, I am in trouble! I guess all of your bills are paid, up-to-date and never late? Like all word of faith, prosperity pimps, the Pimp of Hampton preaches a message of “Look at me now! I am a living example of what God will do when you tithe faithfully and sow into good ground.” The Pimp of Hampton has also preached regularly about the importance of paying bills on time, not dodging bill collectors, and being faithful over your affairs. I find it a bit ironic that this “living example of God’s desire to see us financially prosper” hasn’t paid his own property tax bill – proving that he and his ilk preach a false gospel of prosperity that continues to invalidate itself time after time. If the prosperity gospel message was true, then NO ONE who “sowed money into good ground” WOULD EVER EXPERIENCE FINANCIAL DIFFICULTY, let alone the chief evangelist of the lie. It appears as though the pimps lose again, and the Word of God is further solidified as the truth! No one is condeming this false teacher – I am simply illustrating the failure of his false message and the hypocrisy of his lifestyle. And yes, my bills are up-to-date because by God’s grace I have been able to budget my money and act in a fiscally responsible manner. I don’t give my money to vipers and false teachers, and I take care of my household as the Lord commands in 1 Timothy 5:8, and I certainly don’t preach a lie by begging for money and threatning damnation on those who refuse to comply. To all of the antagonistic self righteous fighters of hope and prosperity out there…. Why should anyone withhold their tithes and offerings based on unfounded assumptions of financial misuse?? Do you think that you are in the will of God by giving without cheer or deciding not to give at all! We can argue all day about whether tithing was due to the biblical law or to support the priesthood. Whatever misuse a Pastor does with your tithes will be handled between him and God. POINT BLANK. Once my tithes leaves my pocket it is “not my concern” of how it’s used because I know that the resources around me are plentiful and are being used for good works. It’s not wrong if it’s in your will to support a local ministry and to give thanks to God with monetary offerings. Do you all have this viewpoint because your ministries aren’t growing and aren’t reaching people?? djenk23 addressed your comment quite well, but your comment is too alarming to let it be. You are essentially advocating throwing good money after bad at corrupt ministries just so you feel good about giving. That’s both ignorant and irresponsible. The “unfounded assumptions” have been proven true in the case of Andre Landers – the tax bill was delinquent because giving is way down at his club. Also, there are 6 false teachers currently under federal investigation and have been asked to open their books – all because they memebers complained about the misuse money that they donated – are those “unfounded assumptions” as well? If you want to throw your money away, then go right ahead – but don’t dare come back here to convince others to blindly “sow” as well. Obviously, you didn’t consume my comments in its entirety. Don’t “slice & dice” and take my comments out of context. “A” delinquent bill (that was later paid) is just not enough to justify your claims. I can’t conclude that people are throwing money away when resources are still plentiful and good works are still being observed. This one bill (that someone dug up out of spite) pales in comparison to all of the goods things that this church has contributed to its members and the community. I’m not against whistle-blowers but, there is not enough substance for an entire congregation to pack their bags and join the rest of the church jumpers. Let it be known, that I would NOT support a ministry if it was truly found to be corrupt. “A” delinquent bill and hearsay from former members is just insubstantial evidence. Not even circumstantial evidence… Good try though. How do sowers of a ministry that blesses and endows those in and around them become bad stewards?? Why wouldn’t God judge the actions of a Pastor that is not a good steward of the tithes and offerings that he has received from his congregation?? Based on your reasoning, I could probably find misuse of money with those people who are about to get their lights cut off… Right? (Sarcasm) Those same people would NOT be in that predicament if they had saved or used their money wisely during times of abundance… Right? (More sarcasm) Why should I throw away my money to people who failed to prepare for times of shortage? (Even more sarcasm) Serves them right if they can’t pay their utilities now that they are living in lack. You failed miserably at proving your point. You just fabricated a comparison that could very easily be placed in the same circumstance that you are trying to oppose me in. Your original comment is clearly printed for all to see, so I didn’t “slice and dice” anything. In fact, I approved the comment because of it’s weak thesis, and so that others could see how apologists keep false teachers in business. Your defense of blind giving is just that – your defense. This tax bill wasn’t “dug up out of spite”, it’s a matter of public record. You – and other pimp apologist – are welcome to defend the vipers all you want, just don’t downplay their hypocrisy in the process. It is you who has failed miserably in your defense, so I’ll spare you the waste of more of your time in coming back to (attempt to) expound further. Whoa, Whoa. I may be acting a bit slow, but are we talking about Pastor Andre Landers?